I really enjoyed the day and meeting everyone. It all felt like it was just meant to be. Ros is a wonderful teacher who brings so much love, joy and wisdom to her teaching. I was a little worried about my lack of knowledge of art and my ability to do art, but Ros made me feel at ease and once I got started I really enjoyed the day. 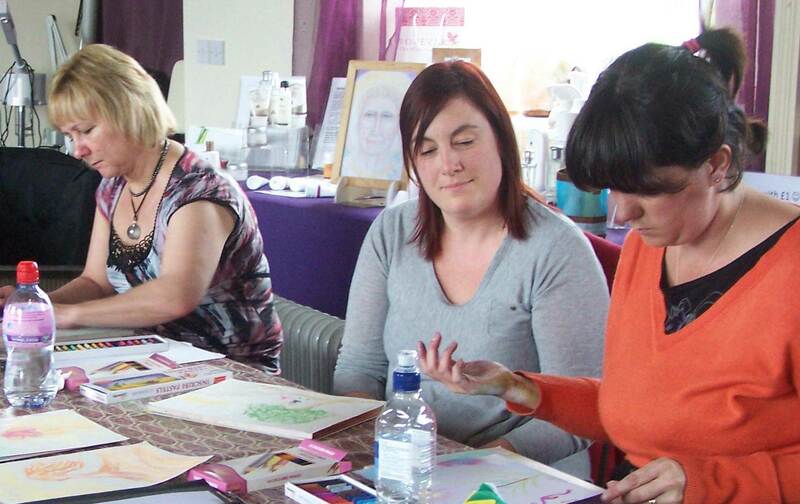 It was wonderful to have the time and space to create psychic images in a safe, contains group. Loved the relaxed atmosphere and sharing experiences with other people. The best part of the workshop was the guidance given by Ros and the interaction between each person and our spirit guides. Bless you Ros and thank you for this wonderful day. The day worked out far better than I had anticipated. I am now feeling more confident and hoping to continue with my psychic art in the near future. The day went very quickly. Reinforces the message to trust your intuitions and never to judge. Fantastic recommendations for art materials. Ros is very warm and welcoming and I would definitely welcome more courses in the future. It was totally new with some mind blowing aspects which would take time to sink in, rationalise with my faith, belief and the universe. This workshop was excellent for my self confidence. I have really enjoyed this workshop. It has helped me understand how I can connect my spirituality with my art, and also use it to assist me when I’m reading. Fantastic! I felt the time went really fast and would love to do this, or some thing similar, again. Did not know what to expect. Really enjoyed every aspect of the workshop. Learnt t things that I had been having difficulty doing in the past. Ros showed me that there is always another way. I wish this workshop could run every week. Very comprehensive. A great opportunity to try and develop new skills. I will definitely continue with this at home. It was really exciting. Loved it. I really enjoyed the day. It’s the first time I’ve worked with pastels and I love this medium. It was lovely channelling whatever came through and working with the other delegates. “Ros is fab the group was fab. Keep up the fab work you do!